Experience the best of Sydney with this half day afternoon tour highlighting the most popular attractions. Exploring famous landmarks and destinations, the tour offers plenty of sightseeing and photo opportunities including the Harbour Bridge, Opera House, Bondi Beach and much more. Explore the best that Sydney's northern coastline has to offer including Manly and the Northern Beaches as well as the Harbour Bridge, Opera House, Milson's Point, Middle Harbour and Spit Bridge. Manly Beach also provides the perfect background for a spot of morning tea. Great touring option for travellers on a tight schedule or for those who don't like touring a full day, duration 3.5 hours. A taste of Sydney's most popular attractions and destinations, this half day tour with Mount 'N Beach Safaris travels through The Rocks, Harbour Bridge, Opera House, Centrepoint Tower, Oxford Street, Paddington, Bondi Beach and Double Bay giving you a fantastic insight into the wonderful diversity that is Sydney. The easiest way to explore Sydney and enjoy this beautiful city is on the Spectacular Sydney sightseeing tour, combining iconic landmarks such as the Harbour Bridge, Opera House and Bondi Beach with some of the city's most famous destinations including Milson's Point, North Head Lookout, The Rocks, The Gap and Mrs Macquarie's Chair. 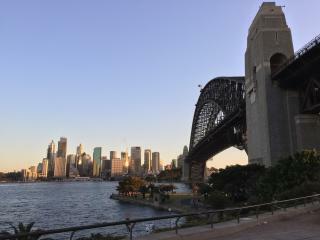 Morning Tour and Afternoon Tour of Sydney combined with break in the middle.